What REALLY Happened When Zina Pierre Quit The Race? Politics is a dirty business. It has been said that Washington delights in ruining the lives of people and apparently some of that sentiment has run over the borders into Annapolis. Zina was not supposed to win. The Annapolis Democratic Central Committee was aware of her issues and chose to keep them secret if and until needed. The “Democratic Machine” consisting of Ellen Moyer, the ADCC, Speaker Michael Busch, and Senator John Astle, orchestrated this to insure that their candidate Josh Cohen was “their” candidate. The “Republican Machine” orchestrated this to insure that there would be enough disenfranchised voters to vote for Dave Cordle. Apparently Chris Fox (Independent candidate for Mayor) also is rumored to be a part of the “republican Machine”. The Capital, their owners and Paul Foer are racist and could not bear to see a black candidate come to power in Annapolis. Did Zina notify any of the powers that be in the ADCC about this possibility? And when? Did Zina and the ADCC really feel that these would not be an issue? Zina was in the White House…with the Clintons…so she knows all about dirty politics. How will voters react to this? Will they see it as a political ploy to place a favored candidate in office? Is this a shot across the bow against the African American Community in Annapolis? Who will the ADCC choose to be their candidate? What harm has this done to the very principles of a fair election? Will there be an investigation into this? Should the other primary candidates automatically be considered? After all the majority of people did not want them. What role did any of the losing candidates play in this? If any? Did the media have this information prior to Friday? If so, why was it held back? The only thins that is for sure is that the Annapolis Democratic voters were given the shaft in this primary. It might have been dealt by Zina, the media, the Democratic Party, or the Republican Party; but regardless of who is responsible, the voters lost out! 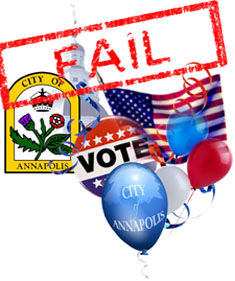 3865 democrats in the City of Annapolis cast their vote for whomever they felt was “the best” candidate on Tuesday and ultimately the selection of the Democratic Mayoral Nominee will rest solely with the 8 people (there is a vacancy) on the Annapolis Democratic Central Committee. As the days wear on, there will be more and more theories and questions. Do you have one? Got an opinion? Please leave a comment.